Are you looking for a better way to manage your blog content? Do you need a tool to outline your blogging workflow? We’ve got you covered! 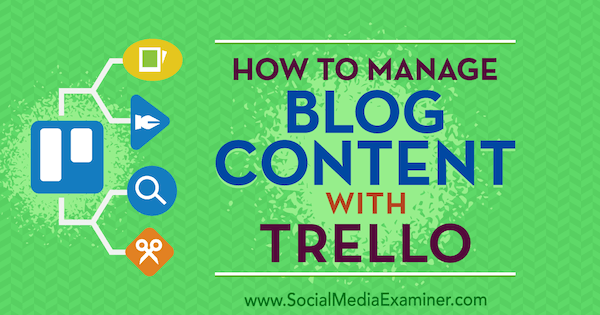 Check out this article on how to manage blog content from beginning to end with Trello, including how to effectively organize how you brainstorm, write, and publish your blog’s content. Trello is your one-stop solution for organizing your blog content from ideation through publishing. What makes Trello ideal for this workflow is that you can sort your lists chronologically across your board to support blog content creation. We’re a big fan of Trello and hope it helps you get organized! Let us know what you think in the comments. Despite the growing popularity of Agile Marketing and the fervent evangelism of early adopters, most marketers remain at least a bit confused, says industry expert Andrea Fryrear, Chief Content Officer for Fox Content. We get it. Questions are to be expected. Why? Because, although the basic Agile modus operandi is fairly straightforward – release work rapidly, learn from its performance, and adjust accordingly – agile teams need an internal system that supports a new way of doing marketing. Click here for answers to frequently asked questions about Agile Marketing and how you can make it work for you. Have you properly prepared for and planned your marketing strategy for the upcoming year? We’ve got you covered. Check out top marketing trends to watch for in 2017. As the end of the year approaches, it is time to look back on the year in marketing and analyze the trends we should expect to see in the coming new year. This helps you, as a marketer or business owner, be prepared for and to properly plan out your marketing for 2017. Here are 10 of the marketing trends to watch for 2017. One of the trends that will carry over from 2016 is that marketers are getting better at content marketing. By better, we mean they are having more success with content marketing campaigns. A MarketingProfs report shows that 62% of B2B content marketers are “much more” or “somewhat more” successful with their content marketing than they were last year. The same goes for B2C marketers as well. For the same survey last year, the reported success rates were at just 30%. Of course, this is a good thing because content is so important. However, it does mean being prepared to allocate more budget to content marketing. We know, you’ve been hearing about mobile for quite a few years. It may sound like a broken record, but that’s only because it is so important. Mobile devices are the source of more traffic on the internet than desktops. The other thing to think about when planning your mobile marketing strategy is that you must consider your mobile target audience as if they were moving targets. You, as a marketer, have unique insight to so much of your customers’ lives and activities thanks to mobile data and permissioned data. You know that your target audience’s’ needs change throughout the day and thanks to all that mobile data, you can customize your marketing to target your audience where they are and accordingly for what they are doing. Visuals are so important to all of your marketing efforts, not just social media. Visuals can help with your branding, help you stand out, get recognized, and be remembered. If you haven’t embraced visuals yet, it’s never too late to start incorporating them into your plan for 2017. How can you get started? Hire a photographer to take photos of your company and your products. Make sure a good portion of the photos are timeless so that you can continue to use them for different advertising and promotional campaigns. If you don’t have a design team on hand, look into some design apps that take the work out of photo editing and make some creative and catchy photos. Of course, video content could fall under the visual content category we just mentioned above, but it deserves its own bullet point. Static images are not enough. Video has become so important. Video literally reaches out and grabs your audience’s attention. It doesn’t give viewers a choice, it just begins. Try both funny and emotional videos to really connect. Chances are you’ve done it yourself. Have you been shopping lately when you do a price check with competitors while you are in a store? The only way to compete with this is to market to your customers while they are in your stores. Expect to see an upswing in native advertising in 2017. The formats are getting better and more improved. If you shied away from native advertising, you might feel more comfortable with trying it if it is right for your brand. More major publishers are likely to start offering this method of advertising in 2017. Earlier this year, Mark Zuckerberg announced that third parties would be able to access the Facebook Messenger platform. As a result chatbots have grown quickly in popularity. Using chatbots is a slippery slope, but can definitely help increase the speed of engagement and allows for real-time engagement. Influencers have been becoming increasingly important tools for marketers to use. It is the best form of user-generated content. The public is quick to believe what others have to say about your product. When those “others” have a huge audience full of believers, your message reach grows exponentially and in a positive direction. After spending the time and effort to develop the best content, it can often be lost and never seen when you post it across social channels expecting organic content to go viral. Now that Facebook and Instagram do not post content chronologically, most users will only see the most popular posts. How do you get those posts to be popular in the first place? It likely isn’t going to happen organically. As a result, plan for 2017 to start paying for your “viral” content. If you haven’t noticed the popularity of streaming video content, then you haven’t been paying attention. In 2016, Facebook Live introduced a whole new novice audience to live-streaming video. Facebook made it so accessible to the public, that now consumers will be more open to see live-streaming advertising on different platforms. Live streaming is beginning a new trend in vicarious experiences and will cross over into other immersive experience types of content like 360 degree video and augmented reality. Social analytics will become increasingly important, just as important as other analytics you use in your marketing analyses. Social listening and collecting social data will help you through 2017. Be sure to follow this trend and look into tools that will help you process all of the valuable social analytics information that is out there, waiting to be mined. Targeted Email Marketing campaigns to your best customers to boost sales during the holiday season and beyond. Facebook Advertising campaigns to increase brand awareness & sales. Influencer Marketing campaigns & Product Reviews to boost brand visibility in 2017. Traditional & Digital PR Services including Press Releases, Effective Pitching, Content Marketing, Copywriting & more. Don’t delay! Click here to book your complimentary consultation today and we’ll help you make the most of your remaining 2016 budget and/or help you plan your 2017 strategy. Remember to ask about our end-of-the-year specials! Spread a little holiday cheer for your brand. This holiday season, if you’re looking for new ways to boost your brand exposure, drive sales, and garner media attention while also fostering a sense of goodwill, try mixing up your marketing strategy with feel good Public Relations’ initiatives. Below are some quick tips for boosting your PR during the holidays. Increasing numbers of brands are mixing social good into their marketing and PR programs. Not only is it smart; it can reap big rewards as well! Studies show that consumers are more prone to make purchases and seek out services from businesses and brands that give back and do good for the world. As a matter of fact, in a recent survey, 87 percent of consumers said they would switch brands based on a connection with a good cause. As with any marketing initiative, holiday PR requires a clear, compelling message. It’s also important to target the proper audience with a relatable, easy to follow offer and mission. Potential customers need to know specifically what or who their purchase will benefit. So host a toy drive or a coat drive to benefit a local charity and attach it to an offer for your business! Not only will you boost your sales, garner media attention (don’t forget to send a press release to your local media announcing your campaign and one after reporting on results) but you’ll also be perceived as a company that cares. You can also support a charity during the holidays with a campaign that doesn’t attach a specific offer to it. One of our favorite promotions of all time is Macy’s ‘Believe” Campaign that invites kids to mail letters to santa to benefits the Make-A-Wish foundation. What makes it awesome? While there is no purchase necessary, it drives traffic to their stores and keeps them top-of-mind with their customers. They also always get a lot of press during the holidays as well, which is important for any business trying to stand out in a crowded marketplace. This year, the department store is making their campaign even more interactive, giving their customers an opportunity outside of the store to “show they believe” with the Santa Project, inviting customers to show they believe anyway they can by posting a vid, liking, sharing or re-tweeting with the hashtag #SantaProject to further promote their campaign. How cool is that! Click here to view their YouTube video. Another great way to give back is by providing helpful holiday tips that help your potential customers solve problems they are facing during the holiday season. Get creative! You can write a blog post, send a tips-related press release, pitch and/or contributed article to your local media outlets, post an article on your LinkedIn page, or post on hyper local news sites. You can even host a free workshop! Not only will you establish your industry expertise, but you’ll be providing a valuable service to the community while potentially driving traffic to your business, website, or blog. Whether you host a holiday outreach effort or craft seasonal tips to share, don’t miss out on a great opportunity to build your brand awareness while also celebrating the season of giving. Chances are, you’ll boost your sales while also generating positivity and goodwill in the world. Author April NeillPosted on December 19, 2016 December 19, 2016 Categories Chariable Giving, Giving Back, Public Relations, Social Impact InitiativesTags Charitable Giving, Holiday Marketing, Holiday PR, PR TipsLeave a comment on Spread a little holiday cheer for your brand. If you’re looking to avoid common pitfalls of DIY PR, we’ve got you covered! Click here for six frequent mistakes entrepreneurs and others make when doing their own PR that you’ll want to avoid if you try to do it yourself. That said, there’s also many reasons for hiring a seasoned PR professional. Like most things you may be able to pay for, legal advice or air travel for example, it’s usually best to pay a pro. If you do need help with a press release or pitch, content writing and strategy, email marketing or campaign, give us a call at (815) 651-0656 for a complimentary, no-obligation consultation. We’re here to help! Top Reasons Why your SEO Plan is Failing. Executing a search engine optimization strategy isn’t enough to get you on the front page of Google’s search results. Even with an SEO plan in place, there’s a strong possibility it isn’t working the way you hoped and expected. There are a number of reasons your SEO strategy is failing to get you prime real estate on the first page. Without an understanding of what you’re doing wrong, your content will most likely get lost in the middle of the pack. Click here for three of the most common—and crippling—mistakes to avoid. Author April NeillPosted on February 26, 2016 Categories Branding, Marketing, Online Branding, Public Relations, SEOTags Branding, Online Marketing, SEO, Small Business TipsLeave a comment on Top Reasons Why your SEO Plan is Failing. Relevance Key Ingredient to Great PR. As a PR professional, I can say unequivocally that great PR is all about intention. Knowing who to pitch; crafting a pitch that resonates; knowing when and how to pitch; all key ingredients to producing PR that gets results. Creating PR that’s relatable is key. Check out this article from Forbes Magazine on how to make great PR by putting relevance first. Click here to read more about why relevance matters in PR. Still need help? If you need support creating news and press releases that resonate and connect with your audience, we can help! April Neill PR has 20+ years’ experience helping businesses tell their stories, crafting messages that matter and producing PR that connects and delivers results. Author April NeillPosted on February 8, 2016 February 22, 2016 Categories Communications, Entrepreneur, Press Releases, Public RelationsTags April Neill Public Relations, April Neill PR, Effective Pitching, Intention, PR Tips, Small Business TipsLeave a comment on Relevance Key Ingredient to Great PR.